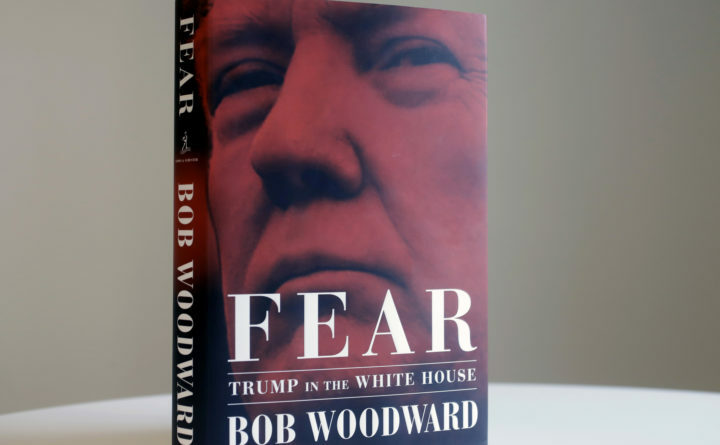 A copy of Bob Woodward's "Fear" is photographed Wednesday in New York. It's not clear whether President Donald Trump has much to fear from "Fear" itself. But the book of that name has set off a yes-no war between author Bob Woodward and the president, using all the assets they can muster. Every damning and depressing detail in Bob Woodward’s new book “Fear: Trump in the White House” is made more damning and depressing by the fact that the abhorrent behavior chronicled in crisp detail will come as no surprise to anyone who has served President Donald Trump in the West Wing, or carried his political water on Capitol Hill. Woodward’s “Fear” contains a wealth of detail thanks to the most surprising decision Trump has made since entering politics — placing a number of qualified people in top jobs. White House Chief of Staff John Kelly, Defense Secretary Jim Mattis and former economic adviser Gary Cohn could all have been offered similar assignments by a President Hillary Clinton. In making those appointments, Trump set a trap for himself in two very different ways. Nonetheless, what “Fear” reveals is an unwinding of Madisonian democracy that continues today. Trump’s unending, aberrant behavior will continue shaping special counsel Robert Mueller III’s investigation. His impulses will continue to cause political bedlam around the world. The United States will continue facing foreign threats because of his wayward geopolitical instincts. For those anxious for Mueller to end this misery, here is a reminder: The Trump presidency can be expected to end in one of five ways: resignation, impeachment and removal by Congress, removal via the 25th Amendment, defeat in re-election, or the conclusion of a second term. That leads to two takeaways from Woodward’s book, one depressing and one heartening. The depressing truth is that any of these five exits — including a half-dozen more years of this extra-constitutional horror show — are possible. The more heartening message from “Fear” is that we still have institutions and individuals, including Bob Woodward, who will continue checking Trump’s most destructive instincts.